Do you have a pickup truck and want to make some extra money? We need hard working individuals for doorstep valet waste removal at Apartments. Take bagged trash from each building door & take to trash compactor located onsite — no Exp. Req'd! Just a Good attitude & late model pickup. Will train the right people! Part-time shift hrs are Sunday - Thursday between 8:30P-10p. Only 10-15 hrs per week @ $15-20 Per Hour! 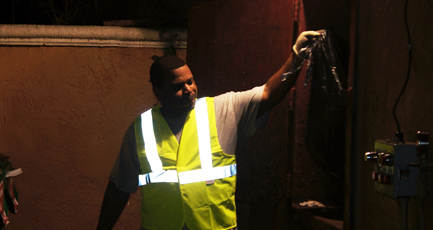 We provide door to door trash collection at apartment complexes — five nights a week, evenings only. We do not take furniture or bulk items, and just normal household bagged trash. There is no off-site hauling or landfills; all waste is brought to the compactor right on site. It is an excellent source of extra income, pay a couple of bills, make a car payment. Must be able to pass a background check, have valid driver's license, Social Security card. Pickup truck required — auto insurance on the truck with your name on the policy. Be PREPARED to WORK and COLLECT bagged trash COLD, RAIN or SHINE, five (5) days per week! Punctuality — MUST Be on property onsite 8 PM Sharp! Residents EXPECT trash to be removed quietly as they get ready for bed! Communication— daily contact with valet Field District Manager. Must be very comfortable with smartphone & apps. Thank you! For Reaching out to National DoorStep. HR will contact you to Review Qualifications.